An attractive smile is a coveted asset in today's world but stained, crooked, poorly shaped, worn or damaged teeth can detract from it. 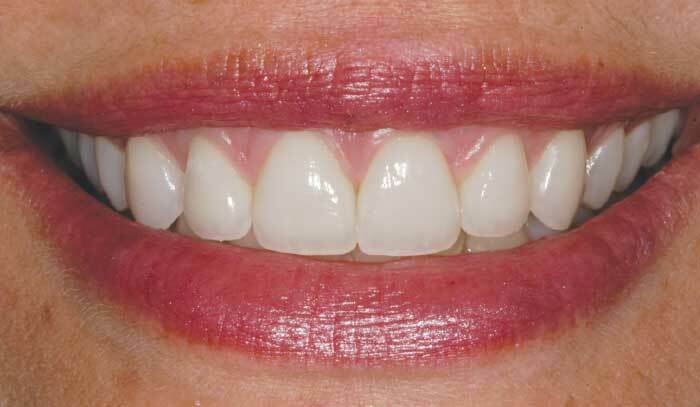 Dental veneers are one way to mask these imperfections and have the potential to dramatically improve your appearance. Veneers are thin coverings or shells made out of tooth-colored dental porcelain or composite resin that are securely bonded to teeth to improve the color, shape, and overall aesthetics of your smile. Porcelains have a translucent, light-reflective quality similar to tooth enamel, which means they look extremely natural. The concept of veneers was introduced over three decades ago but newer materials and techniques have revolutionized this treatment modality making it one of today's most popular and successful cosmetic dental procedures. This woman was unhappy with the appearance of her teeth. A model of her teeth was used to create customized veneers. 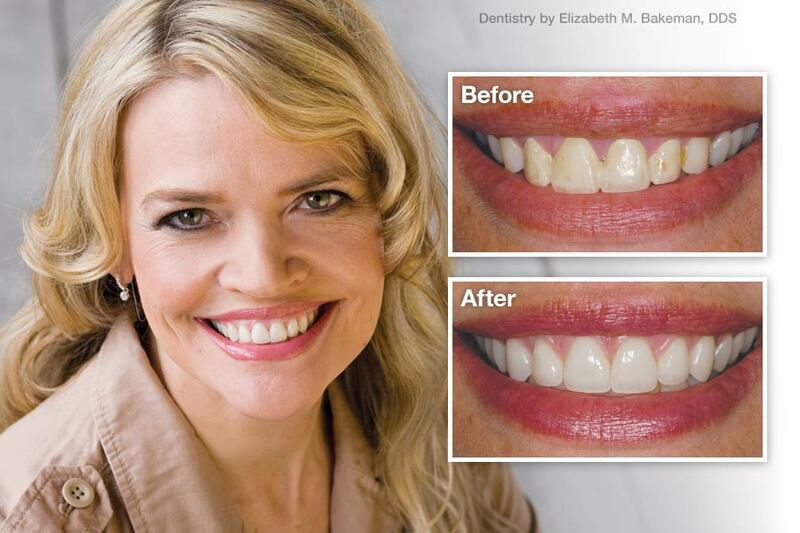 The new veneers give her a beautiful, natural-looking smile. The name "porcelain" derives from16th century French porcelain, "cowrie shell" and Italian porcellana, "young sow skin" — both apparent references to their translucent qualities. Porcelain is a glass-like ceramic, generally made by heating a kaolin (aluminum silicate) containing material to high temperatures. During the process it fuses, changing both its appearance and physical characteristics. Whether veneers are right for you is something you should discuss with a dentist who is very familiar with cosmetic techniques. At the same time it is also important to discuss your desires and expectations. While you may think that excellent results boil down to the material or technique used to create the veneers, that's only part of the story. Porcelain veneers that seamlessly and beautifully enhance your smile and facial features are the direct result of the skill and artistry of the dentist/ceramist team. That is why it is very important to see the quality of the dentistry that such dynamic duos have provided for other patients. Communication is essential so that everyone on the team has a clear vision of the anticipated result. You should therefore take an active role in the process, which will include determining the size and shape of your teeth, and the desired color of the final result. Once all your questions about appearance, tooth preparations, durability, appointment commitments and costs have been answered, it is time to begin the process. Computer Imaging can help you visualize your new smile. While it's not always possible to transfer changes from computer to reality, special software allows your dentist to simulate various changes in the shape, color, and position of the teeth so you can have a glimpse of what changes may be achievable. Diagnostic Mock-ups ("Trial Smile") provides a more realistic opportunity to visualize or even literally "try on" your new look. Your dentist can add tooth-colored filling materials directly to your teeth to temporarily improve their shape, form and color. This mock-up can be removed after the preview or it may be attached firmly enough to be worn for several weeks. Preparing Your Teeth For Veneers will be necessary unless your teeth are small and spaced. This tooth preparation involves removing a thin layer of enamel in order to accommodate a veneer 0.3 to 0.7 millimeters in thickness. 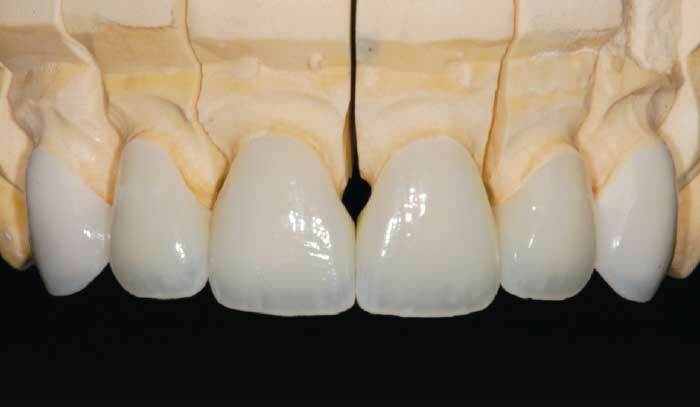 Next, a precise model of the prepared teeth is made upon which porcelain veneers can be accurately fabricated. An impression of the prepared teeth is therefore taken using putty-like material, or the teeth can be scanned digitally using a computer. Provisional (Tryout) Veneers are placed on the prepared teeth while the final veneers are fabricated. They protect the prepared teeth and also act as a blueprint. 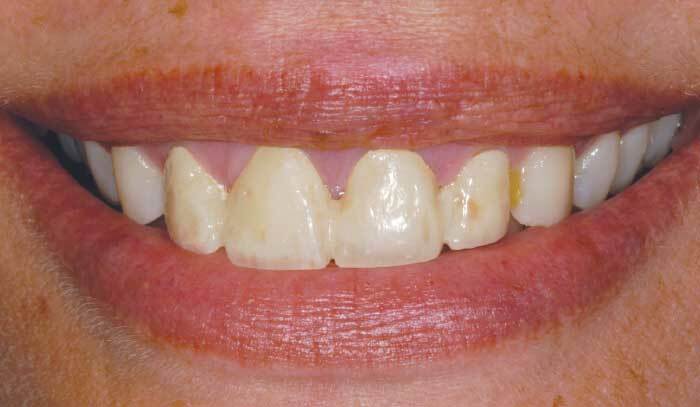 You can live with these interim restorations and even alter them until you are completely satisfied with aesthetics, speech, and function before proceeding to the permanent veneers. Composite Veneers are made of composite resins, which comprise a mix of special plastic and glass of varying proportions, depending on the application for which they are used. They can make very acceptable provisional or in some cases permanent veneer restorations. They can be directly sculpted on the teeth by a skilled dentist, or fabricated using Computer-Aided Design/Computer-Aided Manufacture (CAD/CAM) milling technology. Composite veneers can be very beautiful but tend to stain and chip more readily than porcelain veneers. With today's newer materials, composite veneers are also stronger and more aesthetic than ever before. Tooth Color Selection is both a science and an art. It is also one of the more important and complex parts of the process. It requires not only choosing the right color and factoring in the surface characteristics of teeth, but also effectively communicating this information to the dental laboratory artisans, ceramists, who will fabricate the veneers. Every person has his/her own color preferences and while some prefer a more natural look, others may opt for a bright Hollywood smile. Communicating your preference to your dentist can help you both to set reasonable goals and expectations. It's also not just about choosing the "right color". The dimensions of what make up color (hue, chroma and value) are critical to making veneers look natural. Natural teeth have a variety of subtle colors, shades and translucencies in them and it takes an experienced dentist/ceramist duo to communicate this critical information. Digital Photography aids in communicating and transferring valuable clinical information from your dentist to the dental lab, including color, shape, size, length and position of the teeth. Photographs are especially useful when it comes to color matching since they provide an effective way to see and analyze variations in tooth color. It is now easier than ever to transfer digital files with cloud-based computing and sharing. The success of your veneers is dependent on minute details and these technologies allow your dentist to communicate them to a dental laboratory artisan across town, the country or the world — in an instant.